I have tried several different types of monthly subscription boxes; teas, beauty, pet products, and meals but this is my first experience with a wine club. 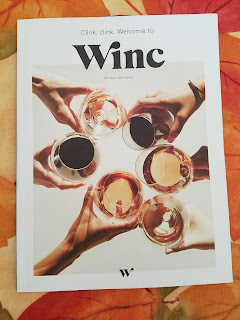 I determined to give Winc a try in order to step out of my comfort zone and start trying different types of wines. Winc is a direct-distribution global wine company that would like for you to have a personal wine experience. To order, you take a Palate Profile quiz that recommends wine based on your own unique taste. This is great because it takes the hassle and guesswork out of picking a bottle from your local liquor store and it delivers the perfect bottle directly to your doorstep. 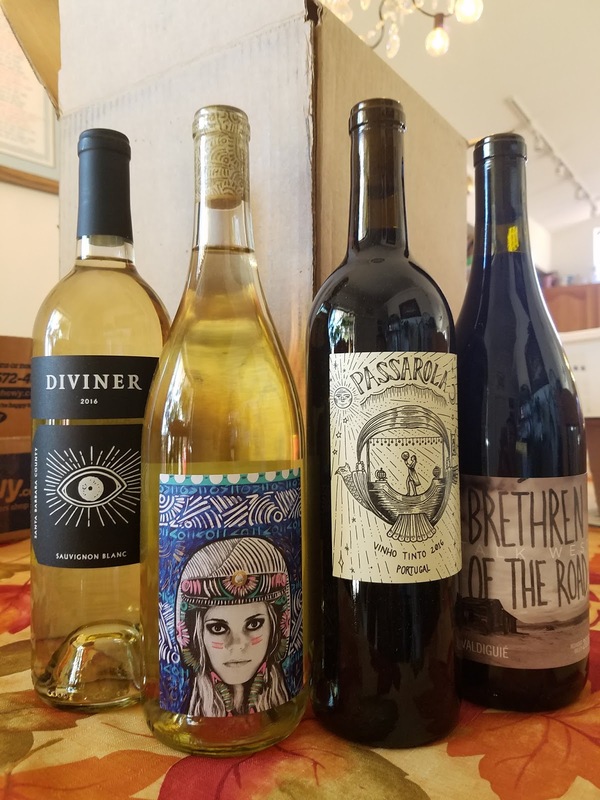 You decide which ones you want out of the 4 bottles that Winc recommends each month. Choose from all white or red, or as I did and mix them up. 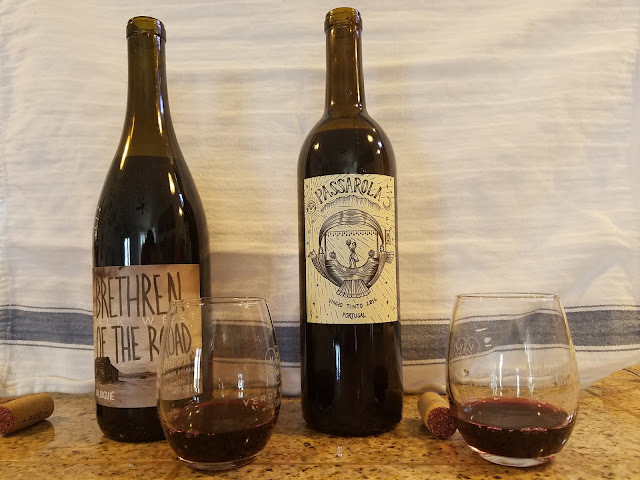 I ended up choosing two whites; 2016 Funk Zone White Blend and a 2016 Diviner Sauvignon Blanc and two reds; 2016 Brethren of the Road "Talk West" Valdiguié and a 2016 Passarola Red Blend. The welcome email included a link so I could read the tasting notes, how to serve the wine and some food pairing ideas for the wines I had ordered. The wines arrived in a very sturdy box with a carrying handle. 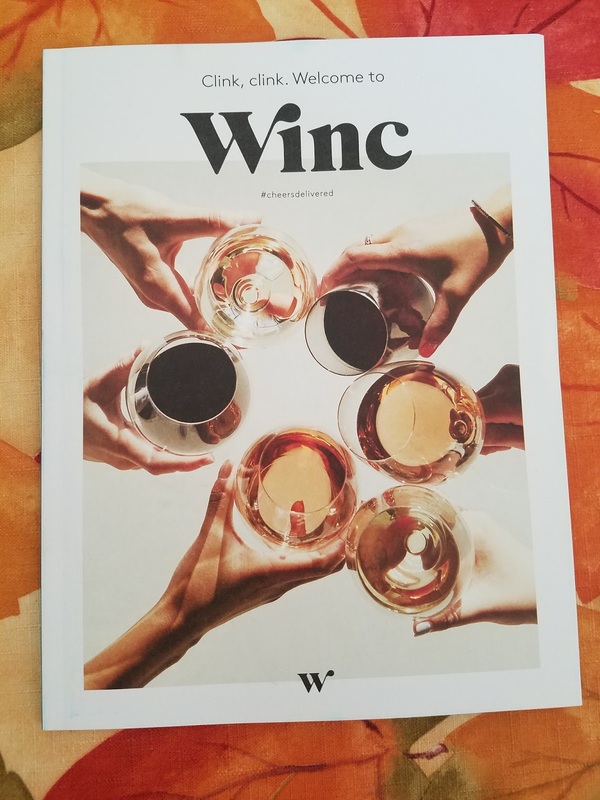 A Winc journal was included in the shipment, this guide includes the A-Z of wine; A is Acidity, B is body, and so on. I found this guide to be very informative. 2016 Brethren of the Road "Talk West" Valdiguié and a 2016 Passarola Red Blend. A unique, California-fresh spin on the unique Valdiguié grape. Kenny Likitprakong, the winemaking partner who created this edition of our Brethren of the Road brand, is a wanderlust-driven, self-professed “hobo winemaker” whose stint in France sparked his allegiance to minimalist, non-interventionist methods. This 2016 Valdiguie - his specialty - is no exception. Made in Mendocino, CA, it’s a savory, light red that reflects Kenny’s spirit; it’s a down-to-earth, go with the flow kind of wine that everyone can enjoy. Bold, high acid, very dry with a slight oak and strong cherry taste. Take a leap into the great unknown with Passarola, a Portuguese red with plenty of spirit.Named for the imaginative “balloon ship” invented in 1709 by a priest in Lisbon, Passarola brings unique Portuguese wines stateside. This Vinho Tinto is a blend of 40% Aragonez, 30% Castelão, 20% Touriga Nacional and 10% Alicante Bouschet. Destemmed and fermented in stainless steel, it's a rustic, robust, and full bodied red with plenty of tannin and grip. Low acid, very dry with a short finish, low body, cherry, earthy taste. This is odd but I tasted licorice. Easy to drink. 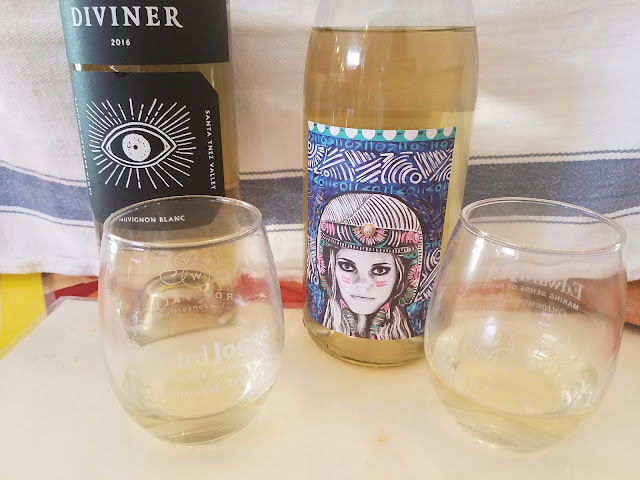 2016 Funk Zone White Blend and a 2016 Diviner Sauvignon Blanc. The Funk Zone is an ultra-fresh white blend features aromatic stone fruit and floral notes, plus crisp acidity and a pop of citrus. Funk Zone embodies the experimental spirit of Santa Barbara County winemaking with unique, boundary-pushing blends. Each vintage expresses the unconventional, funky and cool in its own way. This white blend of Sauvignon Blanc, Viognier and Chenin Blanc was produced from Santa Barbara County grapes and fermented in stainless steel. Drink it with a disregard for the rules. High acid, big bouquet, smells lovely but not to taste. Doesn't blend well. A diviner sees the future and makes it true; our truth lies in the racy acidity of this Santa Ynez Valley Sauvignon Blanc.A vision of what’s to come, Diviner seeks out emerging Bordeaux varietals from Santa Barbara County. Sourced from two well renowned vineyards in the Santa Ynez Valley, this Sauvignon Blanc was fermented in stainless steel and lees stirred once a month for texture, which kicks the fallen sediment, or lees, back up into the juice. Crisp and lean, with light body and mineral notes, it’s a divine expression of Sauvignon Blanc. High acid, pear, grass, citrus, with a chalky mouth finish. Order from here to get $22 off your first month of Winc Wine, making each bottle start at $13 each. Membership is free and continues until you cancel. Taxes may apply. Shipping is complementary on 4 or more bottle orders. A $9 shipping fee will be added to orders of fewer than 4 bottles. You can cancel at any time. You can modify or skip any scheduled order (no fees). An adult must sign for all deliveries so use a shipping address where someone over the age of 21 will be available during the day to receive and sign for packages. They don't ship to PO Boxes. They do not ship wine to the following states: Alabama, Alaska, Arkansas, Delaware, Hawaii, Kentucky, Michigan, Mississippi, Oklahoma, Rhode Island and Utah. 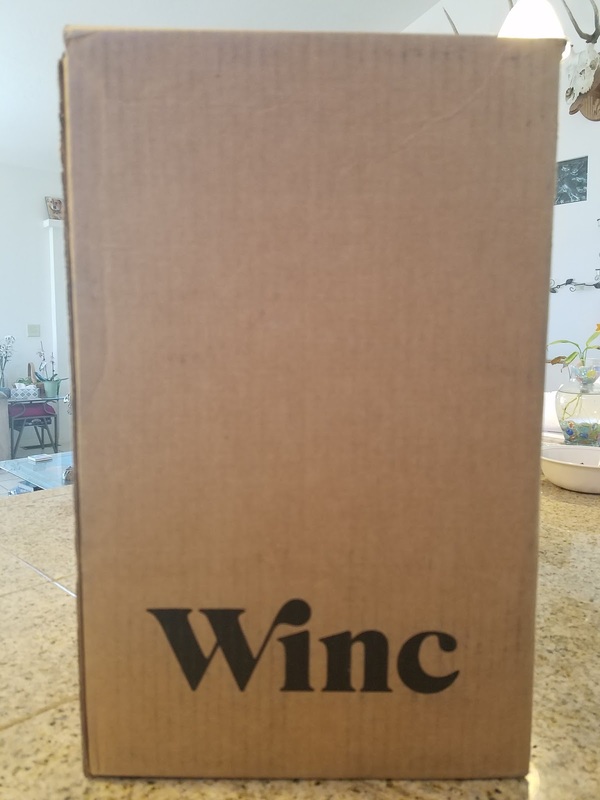 When your friends and family use the link below they will earn a complimentary $20 of Winc wine! As a gift, you'll get $13 on their 1st shipment, and another $13 on their 2nd. To learn more about how referrals work, click here.